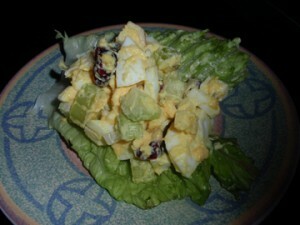 Lettuce And Egg Salad recipe by Nazia Nazar at PakiRecipes.com. Boil eggs in water for twelve minutes. Cool them, peel and place in cold water. Wash the lettuce leaves in running water and keep in chilled water. Tear lettuce leaves with hand and gently mix eggs with them. Make a dressing by mixing salt , white pepper powder, crushed black peppercorns, vinegar , mustard powder and salad oil. Mix this gently with the prepared lettuce and eggs.